Dante Alighieri (ca. 1265-1321) - Italian poet who, like Giotto, was at the forefront of the Renaissance. In fact, both men were from Florence and knew one another (Giotto painted Dante). Very little is known of Dante's formal education. He may have been home schooled or studied at a small Catholic institution at a church near his home. Through his writings, though, it is known that he was most influenced by the ancient Roman writers, namely Cicero, Ovid and especially Virgil. Interestingly, he was the great-great-grandson of a man named Cacclaguida, a warrior in the Second Crusade. Although Cacclaguida's existence is confirmed by additional documents, almost nothing was known about him until Dante mentions him in his Divine Comedy. At the age of nine, Alighieri met a girl named Beatrice, a year his younger and claimed to have fallen in love with her at first sight. However, when they became adults, she married another man; but his feelings for her never changed, despite the fact that he himself would marry another woman. When Beatrice died in 1290 at the age of only 24, Dante was forlorn and turned to his poetry for solace. He wrote a collection of works (both poetry and prose) dedicated to Beatrice, called La Vita Nouva. But his most famous poem, The Divine Comedy, is often considered the greatest work of literature in the Italian language. It contains Dante's allegorical view of the afterlife as he travels through heaven, hell and purgatory meeting various figures along the way. As such, the poem is divided into three parts; called Inferno, Purgatorio and Paradiso. It is the first part, Dante's Inferno which is the most famous and compelling. 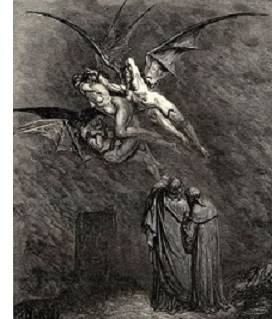 Dante's guide through hell (as well as purgatory) is Virgil, the Roman poet. However, when they arrive in heaven, because he was a pagan, Virgil is forbidden to enter. At this point, his love, Beatrice, who had died before he wrote The Divine Comedy, takes over as his guide. It is in heaven where he meets his great-great-grandfather, Cacclaguida, and presumably reveals information about his life.